Baltimore Real Estate & Ahmad Rozegar "Are You Ready For Results?" "TOP OF THE LINE APPLIANCES"
Bathrooms: 2 "WITH HEATED TOILET SEATS AND A BIDET IN THE MASTER BATHROOM"
Half Bathrooms: 1 "ON THE MAIN LEVEL"
Basement: Yes, Full "WITH A POOL TABLE, MOUNTED 50" PLASMA TV AND ENTERTAINMENT UNIT"
Size: 1,490 sq. ft. "ON THE MAIN LEVEL AND 850 SQ FT ON THE LOWER LEVEL"
This 3 bedroom townhome is in perfect move-in condition with recently painted walls inside and out plus crown molding, not to mention the beautifully updated kitchen with granite countertops, travertine backsplash, recessed pendant, under cabinet lighting and stainless steel appliances. You're also getting an additional family room on the opposite side of the kitchen with sliders to the deck. It has a gas fireplace to cozy up to on chilly evenings, dry bar, with upper and lower cabinets, under cabinet accent lighting , wine cooler and granite countertops. Did I mention the remodeled master bathroom with two person steam shower, 8 jet body sprays and handhelds, granite sink tops and granite surface mounted vessel sinks and heated toilet seats with a bidet.. Lots of closet space all closets are upgraded with California closet systems.The rear yard is fenced with a patio that is landscaped with brick and hardscape and backs to a wooded lot for lots of privacy. By the way... the roof has been recently replaced, laundry room has energy efficient washer and dryer with cabinets, countertop work space, under cabinet lighting and additional shelving, and a water softener, reverse osmosis water filtration system, new updated hvac system with a filter system, air purification system, whole home humidifier and programmable wifi thermostat, a whole home audio system, alarm system with carbon monoxide/ smoke detection and front/back outdoor monitoring system plus DVR capability, mechanicals serviced by BGE Home. Challenge a friend to a game of pool on your pool table or watch a movie on your 50" plasma TV that is mounted on the wall. This is the perfect home for the buyer who wants to be in a community, yet have some privacy! Don't miss this one. 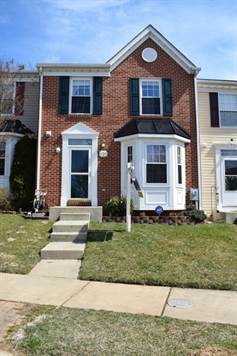 Great location, walking distance to shops, schools, Main street, 795 and restaurants. Plus A Home Warranty!